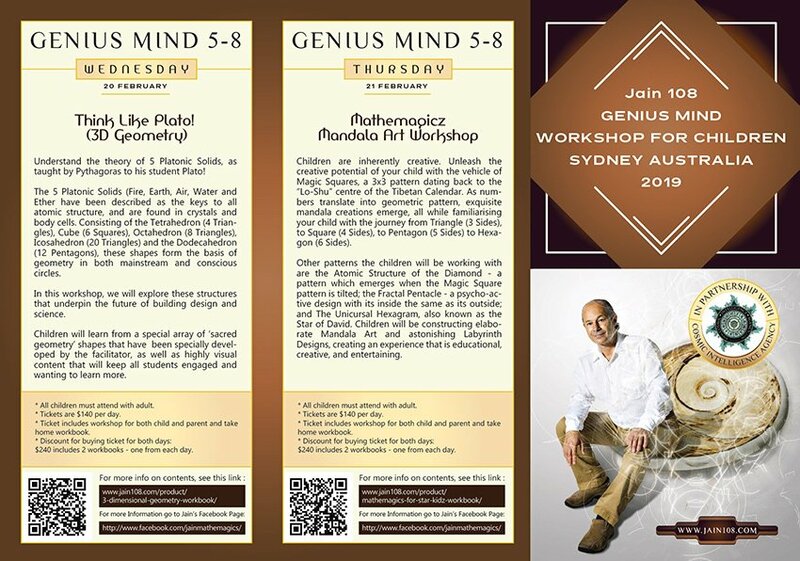 b- The two half days of Genius Mind for Children of various ages. as taught by Pythagoras to his student Plato! The 5 Platonic Solids (Fire, Earth, Air, Water and Ether have been described as the keys to all atomic structure, and are found in crystals and body cells. Consisting of the Tetrahedron (4 Triangles), Cube (6 Squares), Octahedron (8 Triangles), Icosahedron (20 Triangles) and the Dodecahedron (12 Pentagons), these shapes form the basis of geometry in both mainstream and conscious circles. In this workshop, we will explore these structures that underpin the future of building design and science. 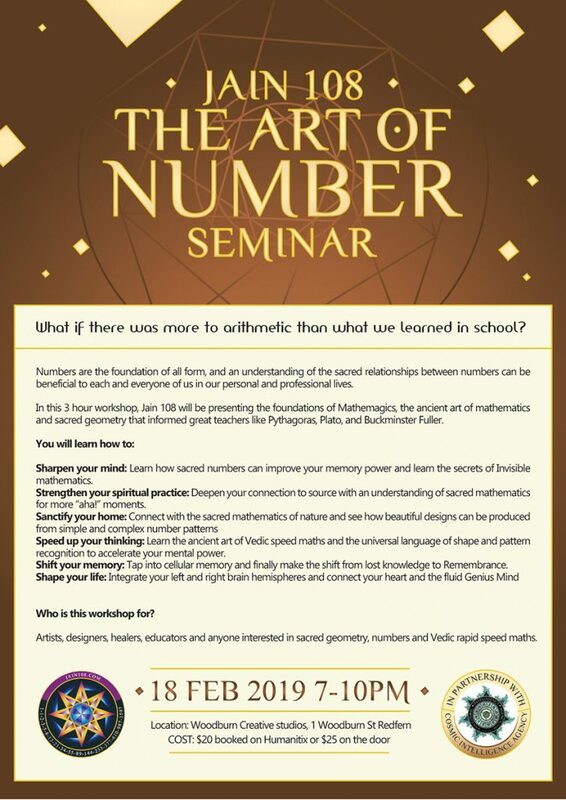 Children will learn from a special array of ‘sacred geometry’ shapes that have been specially developed by the facilitator, as well as highly visual content that will keep all students engaged and wanting to learn more. receive. over 100 pages of essential information and worksheets. Children are inherently creative. Unleash the creative potential of your child with the vehicle of Magic Squares, a 3×3 pattern dating back to the “Lo-Shu” centre of the Tibetan Calendar. 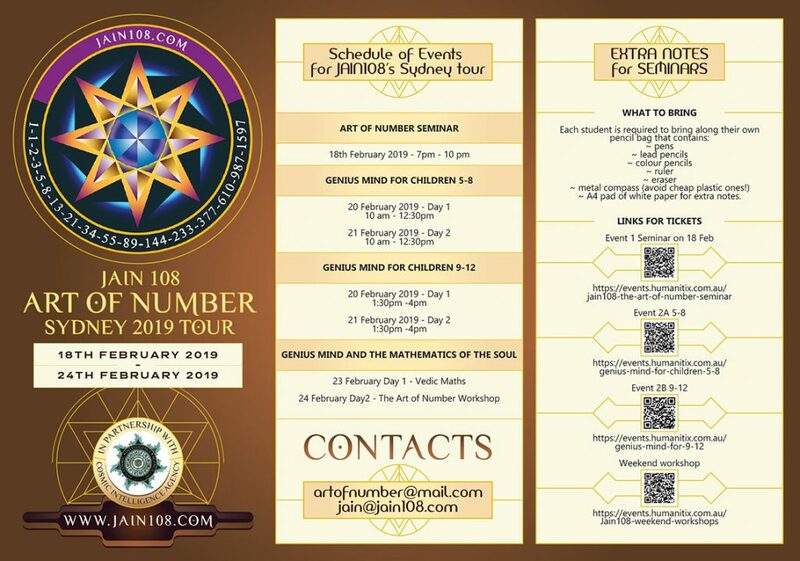 As numbers translate into geometric pattern, exquisite mandala creations emerge, all while familiarising your child with the journey from Triangle (3 Sides), to Square (4 Sides), to Pentagon (5 Sides) to Hexagon (6 Sides). 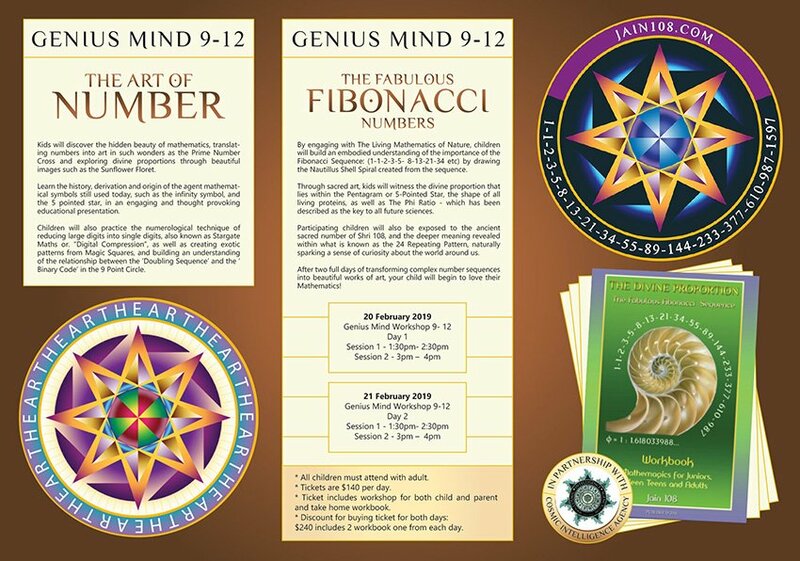 Other patterns the children will be working with are the Atomic Structure of the Diamond – a pattern which emerges when the Magic Square pattern is tilted; the Fractal Pentacle – a psycho-active design with its inside the same as its outside; and The Unicursal Hexagram, also known as the Star of David. Children will be constructing elaborate Mandala Art and astonishing Labyrinth Designs, creating an experience that is educational, creative, and entertaining. $240 includes 2 workbooks – one from each day. www.jain108.com/product/mathemagics-for-star-kidz-workbook/The image below is the front cover of the actual workbook that each student will receive. over 100 pages of essential information and worksheets. 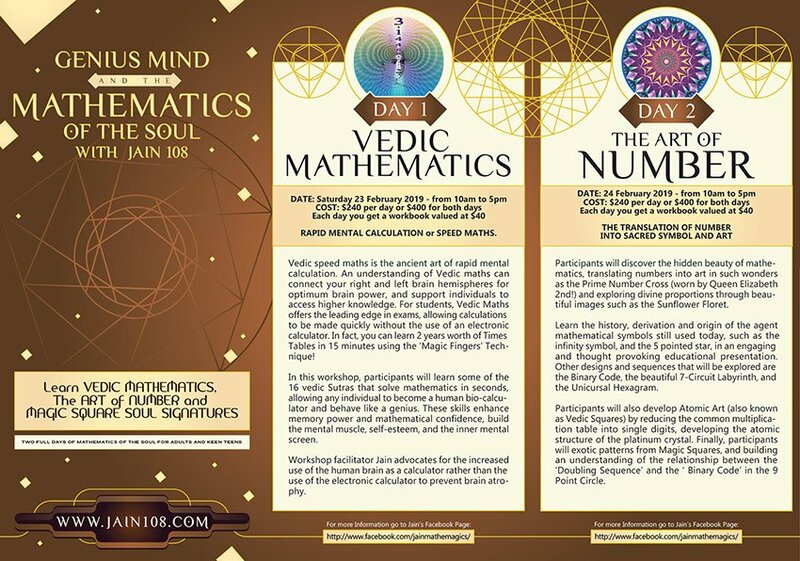 Children will also practice the numerological technique of reducing large digits into single digits, also known as Stargate Maths or. “Digital Compression”, as well as creating exotic patterns from Magic Squares, and building an understanding of the relationship between the ‘Doubling Sequence’ and the ‘ Binary Code’ in the 9 Point Circle.The image below is the front cover of the actual workbook that each student will receive. over 100 pages of essential information and worksheets. Through sacred art, kids will witness the divine proportion that lies within the Pentagram or 5-Pointed Star, the shape of all living proteins, as well as The Phi Ratio – which has been described as the key to all future sciences. After two full days of transforming complex number sequences into beautiful works of art, your child will begin to love their Mathematics! * All children must attend with adult.